The Hawai‘i Tourism Authority (HTA) today released the Hawai‘i Timeshare Quarterly Report for the third quarter, showing that timeshare accommodations grew by 725 units to 11,233 units statewide compared to a year earlier. The increase in timeshare accommodations included the openings of the 411-unit Hilton Grand Islander in Waikīkī last March and the 195-unit Westin Nanea Ocean Villas on Maui last April. Timeshare occupied room nights statewide increased by 4 percent in the third quarter year-over-year. 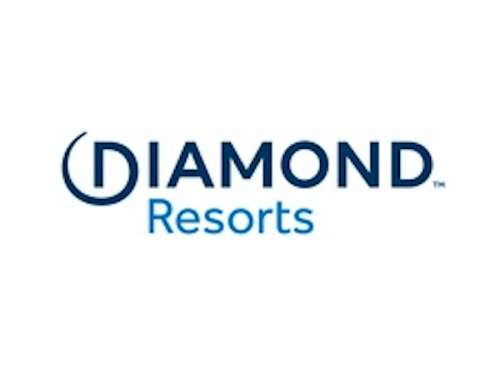 However, with the supply of available timeshare units also increasing by 5.8 percent during the same period, the overall occupancy rate statewide declined slightly by 1.5 percentage points in the third quarter compared to a year earlier. Owners of Hawai‘i timeshare units accounted for 56.9 percent of occupied room nights in the third quarter, while exchangers (timeshare owners participating in a timeshare exchange program) took up 19.9 percent of the occupied room nights. Transient rental of units to owners and exchangers beyond their allotted timeshare stay, as well as to the general public, represented 15.5 percent of occupied room nights. The remaining balance, 7.7 percent, was used for sales and marketing purposes. Jennifer Chun, HTA Director of Tourism Research, noted timeshare properties are essential to Hawai‘i’s mix of accommodations offerings. HTA’s timeshare report showed that 235,112 visitors stayed at a timeshare resort in the Hawaiian Islands for all or part of their stay during the third quarter, an increase of 7.6 percent year-over-year. Of that total, 182,356 visitors, or 77.6 percent, stayed exclusively at a timeshare resort, with the remaining 52,756 visitors, or 22.4 percent, extending their visit in Hawai‘i with other lodging arrangements. Altogether, timeshare visitors represented 9.8 percent of total visitors to Hawai‘i in the third quarter. Timeshare visitors’ average length of stay in the Hawaiian Islands during the third quarter was 9.7 days, which was higher than the average length of stay of 8.8 days for all visitors. The average timeshare occupancy rate for all four island counties dipped slightly in the third quarter year-over-year. O‘ahu timeshare occupancy averaged 92.5 percent (-1.7 percentage points), Maui County timeshare occupancy averaged 90.8 percent (-1.7 percentage points), Kaua‘i timeshare occupancy averaged 89.4 percent (-1.1 percentage points), and the island of Hawai‘i timeshare occupancy averaged 84.6 percent (-2.7 percentage points). The decline in third quarter occupancy was partly due to new timeshare units opening in early 2017, as the supply of available timeshare units outpaced demand. This is reflected in the accompanying bar chart showing the timeshare occupancy rate for the state and by island through the first three quarters. The average timeshare occupancy rate for the four island counties was at its highest in the first quarter of 2017, with statewide at 92.6 percent, O‘ahu at 92.7 percent, Maui at 94.1 percent, Kaua‘i at 91.5 percent, and the island of Hawai‘i at 91.1 percent. With an influx of new timeshare units entering the marketplace, particularly in March and April of 2017, the average occupancy rate dropped in the second quarter, with statewide at 88.2 percent, O‘ahu at 90.8 percent, Maui at 92 percent and both Kaua‘i and the island of Hawai‘i at 83 percent each. 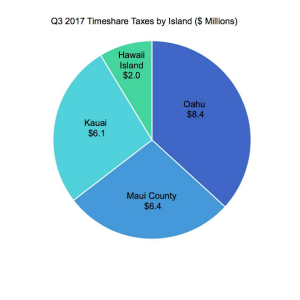 Timeshare properties participating in the survey for the Hawai‘i Timeshare Quarterly Report generated a total of $23.0 million in state and county taxes in the third quarter, including real property tax, general excise tax, timeshare occupancy tax, transient accommodations tax and conveyance tax. Real property tax accounted for the largest share of taxes paid by timeshare owners at $10.9 million, or 47.3 percent, of the total amount. Statewide payroll expenses totaled $79.5 million, as reported by timeshare survey participants. HTA’s Hawai‘i Timeshare Quarterly Report was prepared by Kloninger & Sims Consulting LLC. The timeshare survey findings for the third quarter are based on data provided by 51 individual timeshare properties representing 82.8 percent of Hawai‘i’s 11,233 timeshare units statewide.